These delicious salmon crisps by Michael Smith are sure to be a hit at your next party. 1. Preheat your oven to 350°. Brush the bread slices with olive oil and toast in the oven until golden brown and crisp. 2. Meanwhile place the cheese, Dijon, all but two slices of the smoked salmon and parsley into the bowl of a food processor and whiz until smooth. Spoon into a piping bag with a star tip or into a freezer bag and cut off one corner to fashion a piping bag. Pipe the mousse evenly onto the crisp bread slices. 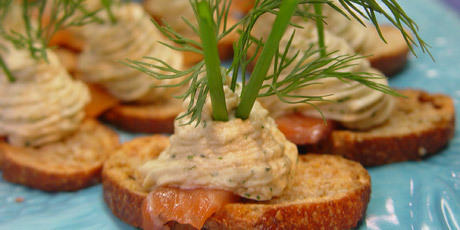 Slice the remaining salmon into thin ribbons and garnish each crisp along with a sprig of dill.